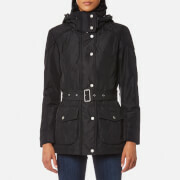 Women’s ‘Black Edition’ windcheater jacket from Superdry. Crafted from strong, durable fabric and decorated all over in a tropical palm tree print, the coat comprises ribbed knit inserts at the collar and cuffs to keep out the cold. 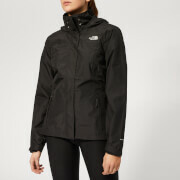 Fastening with a triple layer zip closure, the windbreaker features a hood for extra protection against the elements and a mesh lining throughout for maximum ventilation and comfort. Two zip side pockets and one inner pocket are ideal for storing small essentials. Embroidered branding to the shoulders completes the design.